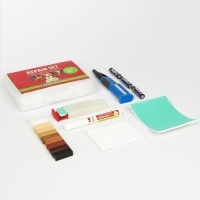 The Paintable Edging tape is an easy solution to the preparation of MDF edges or other boards. No need to apply messy PVA or filler to edges. Simply iron on the edging strip and trim of the excess and it is ready for painting or spray painting. No hassle, quick, clean and easy! The tape is pre-glued and comes in a 50mm width and 0.4mm thickness. Lengths available are 5, 10 & 100 metre rolls, samples also available, select from the drop down box above. Please note this edging is brown in colour. See our 5 step guide on How to Apply Edging Tape. Please see our other listings for Paintable Edging in additional widths and un-glued edging. Suitable for use with Edge Bander machines. We aim to dispatch all orders within 1 working day. Orders placed before 1pm will be dispatched that day (Mon-Fri), orders placed after 1pm will be dispatched the following working day. Dispatched using Royal Mail First Class Post or Courier, depending on the weight of your order. A signature may be required. Samples cost £1 each including postage. The delivery cost of a small package (Inc VAT) is £1.80, medium package is £3.00 and £5.40 for larger packages. Dispatched using Royal Mail First Class Post or Courier, depending on the weight of your order. A signature may be required. Samples cost £1 each including postage. The delivery cost of a small package (Inc VAT) is £1.80, medium package is £3.00, and £6.75 to £19.99 for larger packages. Dispatched using Royal Mail Special Delivery or Courier. This service will ensure that your order is sent by a guaranteed next day method on orders placed before 1pm. Please note that Saturdays and Sundays are not classified as working days and we do not offer delivery on these days. Next working day delivery is not available to customers in the Highlands & Islands. The delivery cost (Inc VAT) is £7.99. We offer Free Next Working Day Delivery to the UK Mainland on Orders over £75 in value. Multiple purchases of edging rolls and veneer sheets may be shipped in continuous rolls. If you are not happy with your purchase, please give written notice and return it to us within 14 days. We will issue a refund, provided the goods are returned in perfect condition and in their original packaging. We may require an image where an item has been damaged during transit. Please return the delivery note with the item and state the reason for the return. We are unable to refund postage costs. Please ensure that if you are returning an item that you obtain a proof of postage or use a 'tracked' postal service, as we cannot be liable for items lost in transit on their way back to us. What is Iron on Edging? Very happy with this product and very quick delivery. Great idea ey to apply and finish, also excellent service. Thx. 50mm paint able edge strip . Excellent product, easy to apply, arrived as promised, no drama. Will be ordering from them again. Would reccommend highly. Exactly what I needed for a tricky little job finishing a triple layer wooden window frame - bonded well and easy to paint. Handheld trimmer, great for trimming edge banding & veneers. Smooth paste. Very fast drying. The absolute BEST filler for sealing MDF edges.